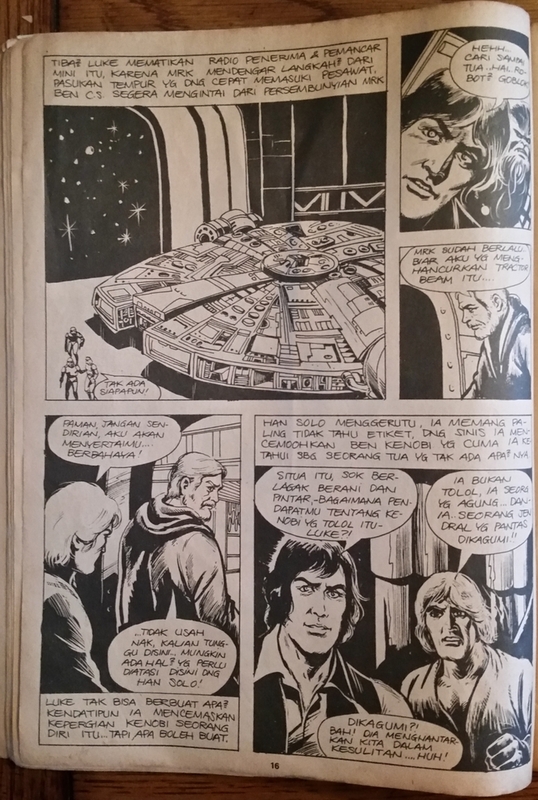 Turkey's publication of the Marvel Comics Star Wars movie adaptation came in 1982. Tercüman Çocuk was a weekly magazine that featured several comics, puzzles, and games. 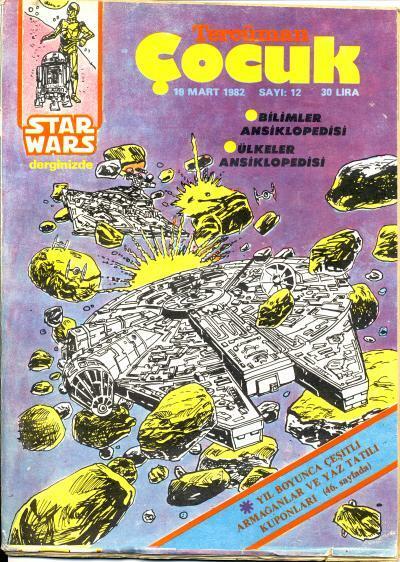 The Star Wars adaptation started with Tercüman Çocuk #4 on January 29, 1982. (The Tercüman Çocuk publication restarts the numbering every year.) 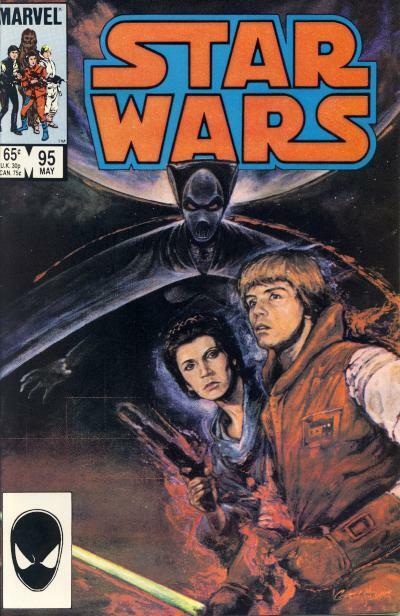 Star Wars ran in the magazine for several years and the movie adaption was spread over many more issues than the U.S. editions. 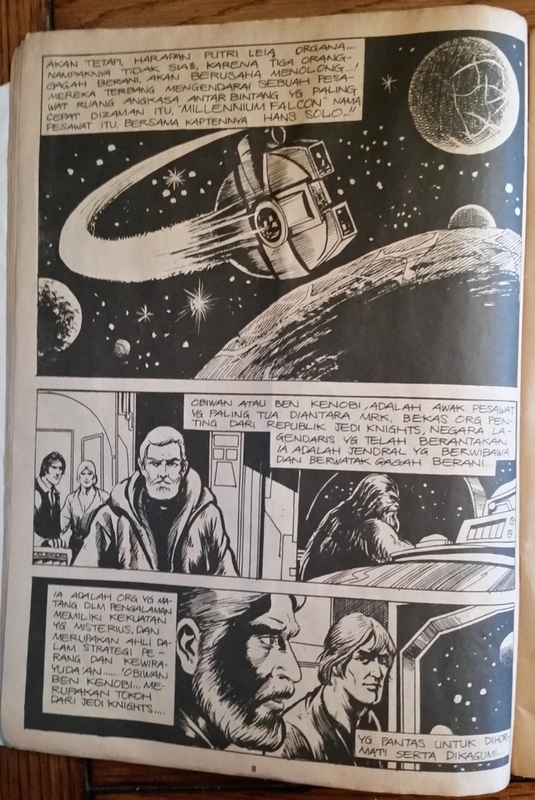 Turkish Tercüman Çocuk #12 from March 19, 1982 contains the 9th chapter in the movie adaption which is 4 pages long. The 4 Star Wars pages in this 52 page magazine are the last 2 pages from Star Wars #4 and the 2nd and 3rd pages from Star Wars #5. 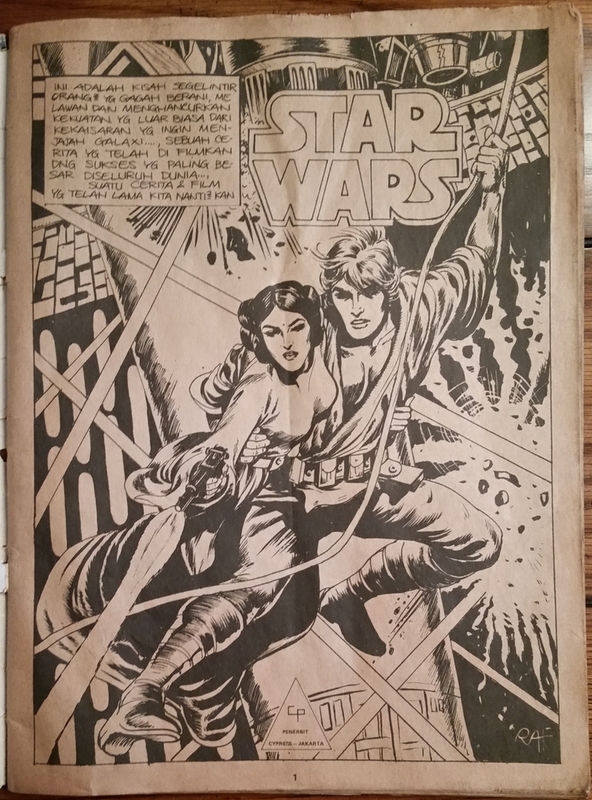 The splash page from Star Wars #5 is not included. 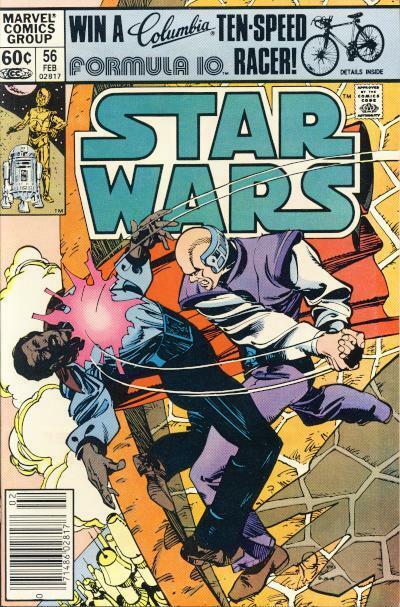 The cover is from U.S. Star Wars #41. 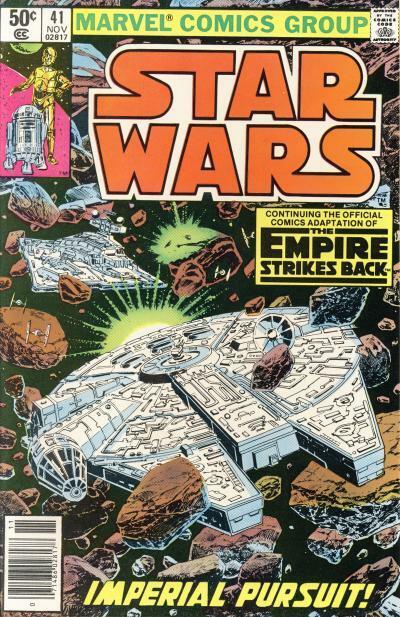 The color choices for the background and asteroids as well as the heavier inks on the Millennium Falcon and the Star Destroy presents the art in a different light, so much so that one wouldn't immediately think of Star Wars #41 when they first see the cover. Inside, the color palette is very limited. In one panel, Han Solo's hair is colored yellow to match Luke Skywalker's hair color. 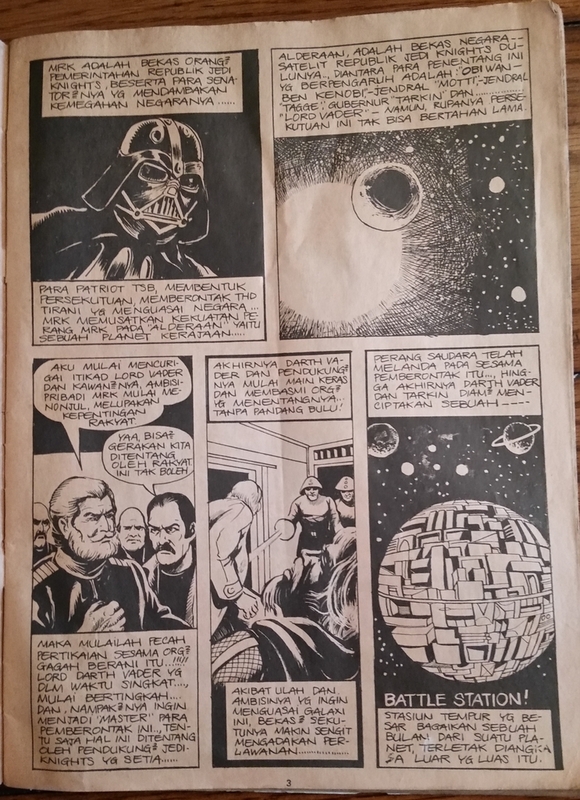 Charles Lippincott has expanded his recounting of the history of Marvel Star Wars comics with two more parts this month. I had posted parts 1 and parts 2 in an earlier posting. This is fascinating reading. He goes into the details about the problems with Howard Chaykin and includes a terrific interview/email exchange with Roy Thomas. He also reveals the print run for Star Wars #1 as being 250,000 copies! You need to go read part 3 and part 4 for yourself. Part 1 and part 2 has been moved to his blog from facebook as well. His other postings are also very informative and I highly recommend perusing his blog, From the Desk of Charles Lippincott. 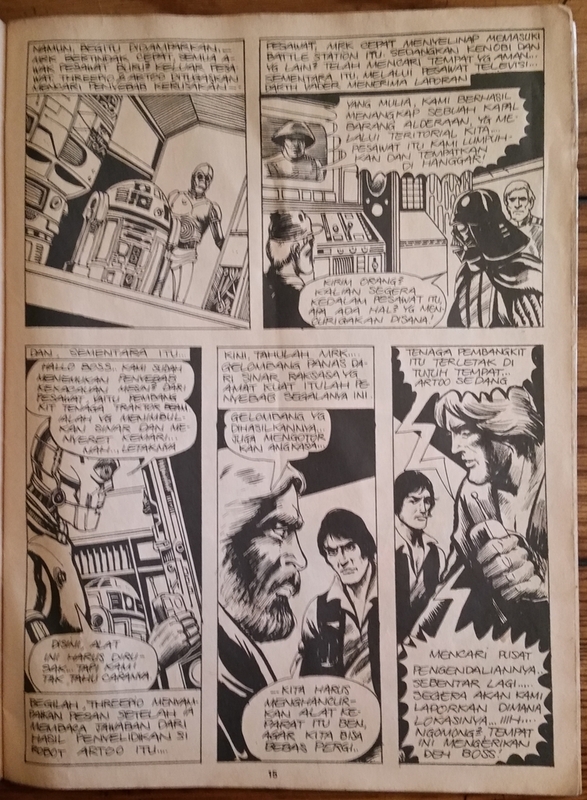 Marvel Comics was caught by surprise with the success of Star Wars and it took them several months to respond with different formats of the story including a paperback and treasuries. By the time The Empire Strikes Back came out, Marvel was ready for the movie release with a paperback, treasury, and magazine version of the story to capitalize on the excitement for the movie. This was no different for Return of the Jedi, except Marvel ceased publishing the treasury format by the time Return of the Jedi came out in 1983. The last treasuries Marvel released in 1982 were for G.I. Joe, Annie (based on the movie), and Smurfs. 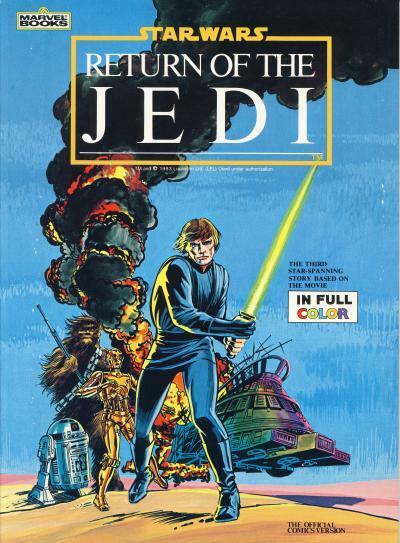 Instead of a treasury for Return of the Jedi, Marvel published a trade paperback. 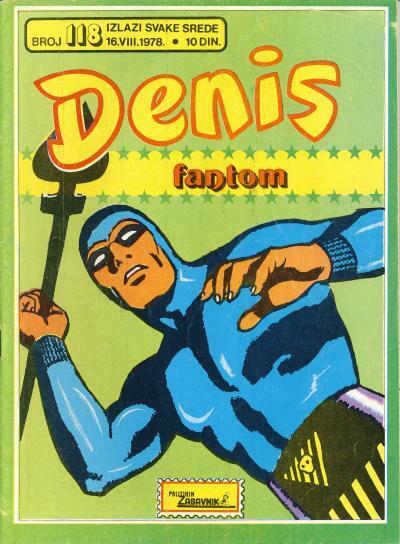 The trade paperback cover uses the same art found on the cover of the paperback. I cannot be the only collector who wished Marvel had released a treasury for the Return of the Jedi. The Marvel Books Return of the Jedi Trade Paperback can be found for $10 - 20 in NM condition. The country of Yugoslavia existed from 1918 until 1991 and had a population of roughly 21 million people in 1978. Yugoslavia was ruled by Josip Tito from 1943 until his death in 1980. 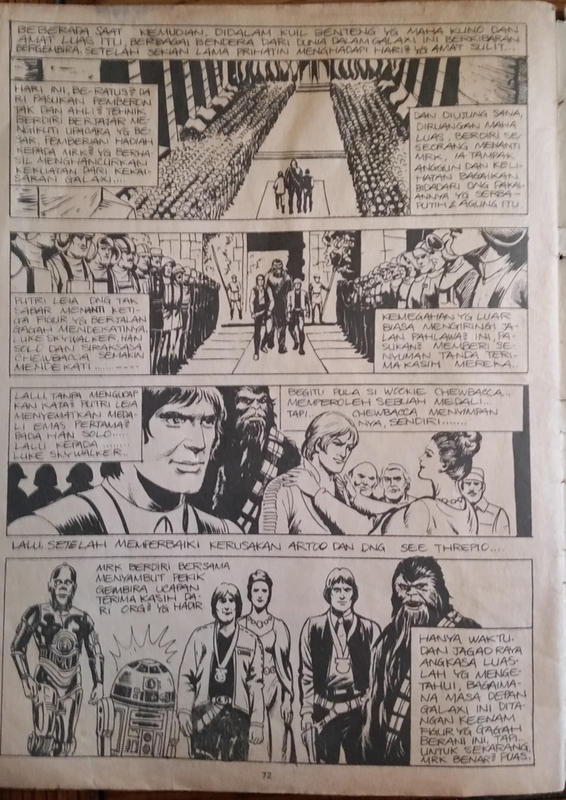 The United States and Yugoslavia had a tentative relationship due to Yugoslavia's independence from the Soviet Union, so it does not surprise me that Western comics made their way to this communist nation. 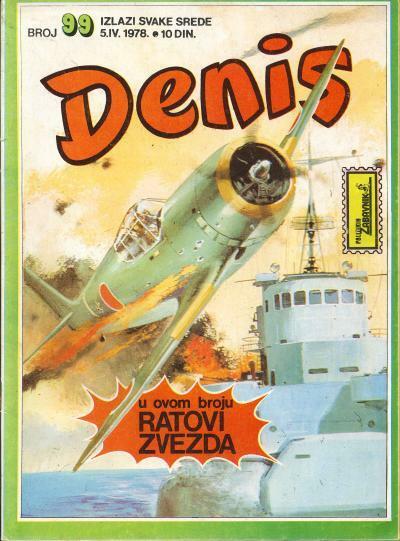 Denis is a magazine published by Politikin Zabavnik in Yugoslavia. 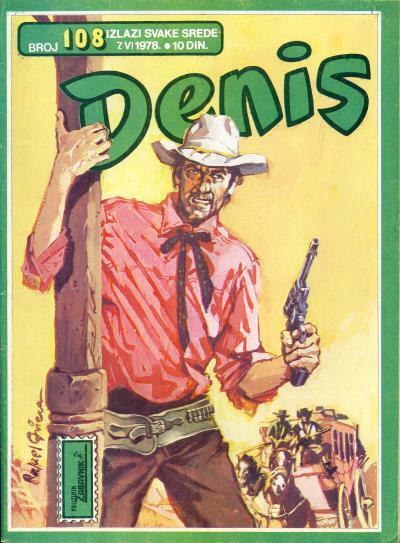 The title ran for 272 issues and was named after the star feature, Dennis the Menace. 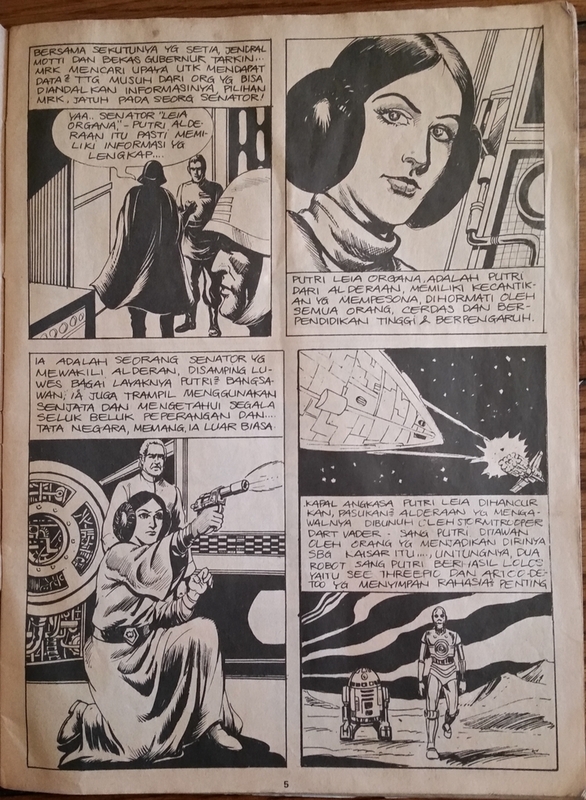 These magazines are 68 pages and the first 10 Marvel Comics Star Wars (Ratovi Zvezda) issues were published in this title. 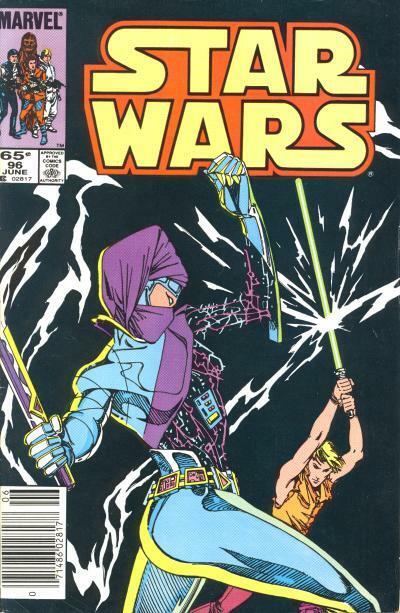 Of the 10 issues that Star Wars appeared, Star Wars was only on the cover for 4 issues. 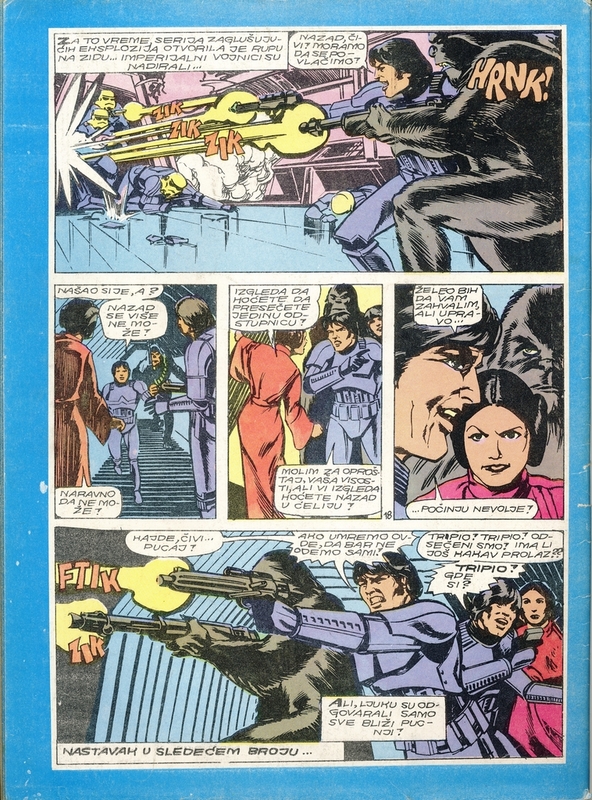 The first issue uses the cover from Star Wars #2. 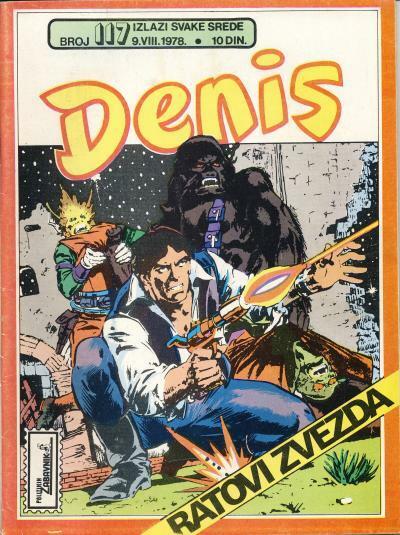 Foreign editions of Star Wars comics make for strange pairings and this is one of the more interesting pairings; Star Wars is included in a magazine with westerns, Dennis the Menace, and the Phantom! 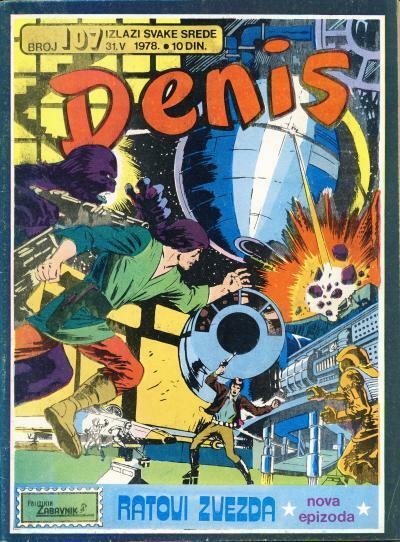 The Star Wars comics are published in color, but the color palette is interesting as can be seen on the back of Denis #97 and 98. 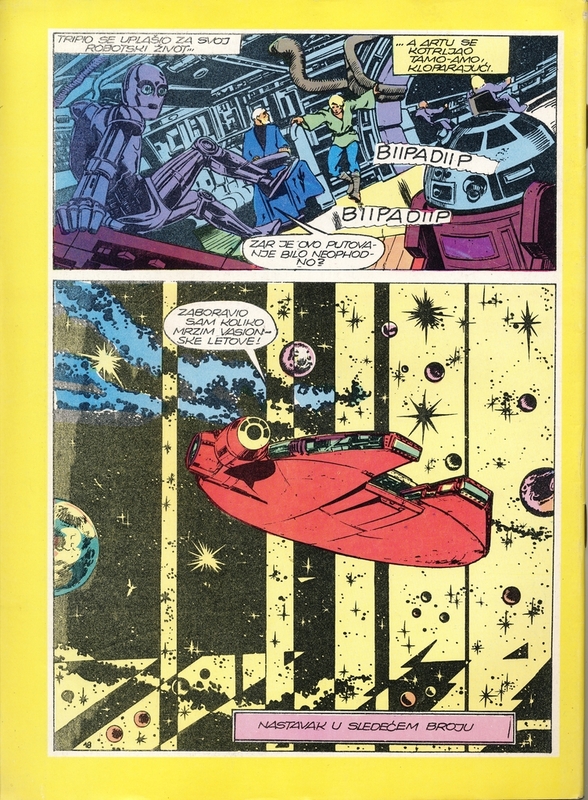 In one panel Luke Skywalker has a green tunic and blue pants, Obi-Wan Kenobi is wearing a blue robe, and R2-D2's body is mauve and in another panel a red Millennium Falcon is flying through a yellow colored space on the back of Denis #97! 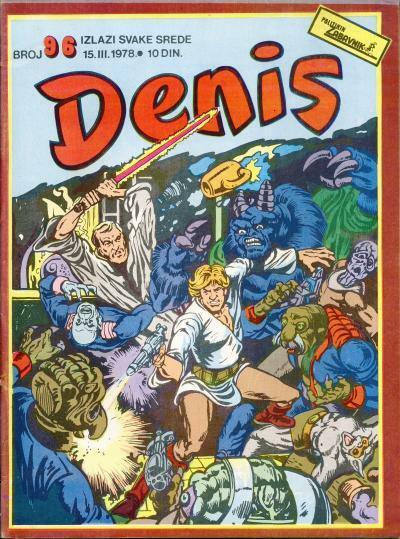 On the back of Denis #98, Princess Leia is adorned in a red dress and our heroes are being attack by light blue Stormtroopers wearing yellow helmets! These same garish colors are seen throughout the issues and set these magazines apart from other foreign Star Wars editions. While Hasbro produced Star Wars action figures and other toys in the 1990s, Galoob also held a license to make small scale Star Wars toys. Their Micro Machines brand was very popular with boys and included cars and other vehicles along with miniature playsets. It made sense for Galoob to release Star Wars miniature vehicles, playsets, and even miniature figures under the Micro Machines brand. Galoob at the time was the 3rd largest toymaker in the U.S. and was purchased by Hasbro in 1999. In 1996, along with other Shadows of the Empire toys, Galoob release 3 Shadow of the Empire Micro Machine sets. Some of these sets contain a 16 page full color mini-comic which measures 4" x 4 1/2". All 3 comics have the same interior with a different cover. The sets are specially marked on the package as containing the mini-comic. The cover of the comic matches the set it comes with. The Darth Vader cover is included in the set I containing Darth Vader, the Xizor cover is in set II with Xizor, and the Dash Rendar cover is in set III with Dash Rendar. The sets without the comic are more common that the sets with the comic. Even so, sealed sets with a comic can usually be found for $10 - 20. Model Products Corporation (MPC) was the original licensor of Star Wars models in the U.S. and they were acquired by The Ertl company in 1985. Ertl had acquired Aluminum Model Toys (AMT) in 1981 and they produced Star Wars models under the AMT/ERTL brand through the 1990s. 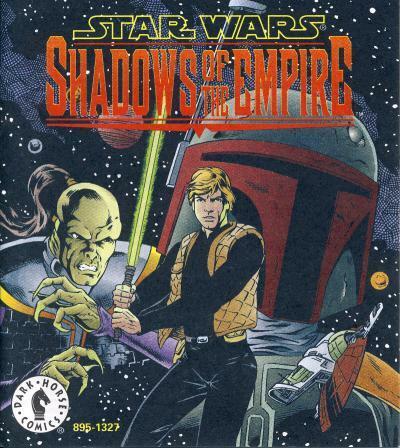 In 1996 the multimedia event, Shadows of the Empire, saw the release of comics, books, toys, trading cards, video games, and other products including models. 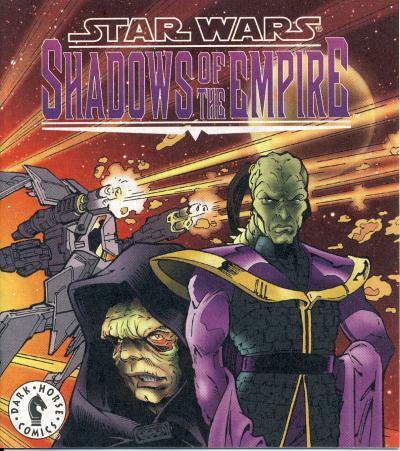 The Shadows of the Empire story took place between The Empire Strikes Back and Return of the Jedi and included all the merchandise that would typically accompany a movie. Select AMT/ERTL models included a 16 page full color mini-comic measures 4" x 4 1/2". 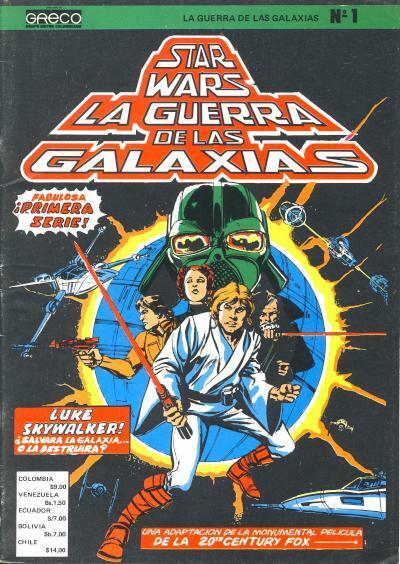 This mini-comic has a picture of Luke Skywalker on the cover and saw distribution in many different Star Wars models including: the Millennium Falcon, X-Wing, TIE Fighter, Slave I, and Encounter with Yoda on Dagobah. Only Star Wars brand models with a sticker identifying the mini-comic will contain the comic. Models without the comic are more common that the models with the comic. The cheapest models found with this comic (the Encounter with Yoda on Dagobah model) usually run $10 - 20. 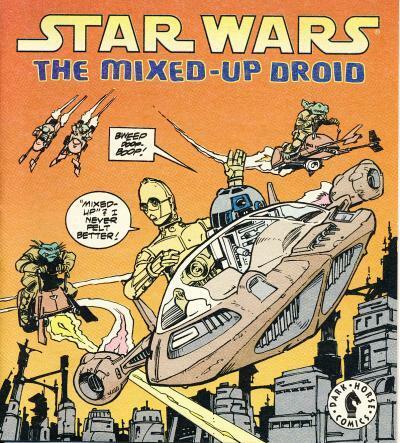 In 1995, Time Warner Kids produced a short audio book called Star Wars: The Mixed-Up Droid. The audio book included a Dark Horse mini-comic which followed the story on the audio cassette. The 16 page full color mini-comic measures 4" x 4 1/2". This can be one of the more expensive Dark Horse comics to acquire. When these are found for sale, prices for a sealed audio cassette and comic usually cost around $100 - 150. In an earlier blog, I mentioned how several foreign publishers bundles several issues into a collection with a new outer cover. I also mentioned that the French publisher Editions Lug did this with the Titans title and sold these collections under the title Titans Album with its own numbering. 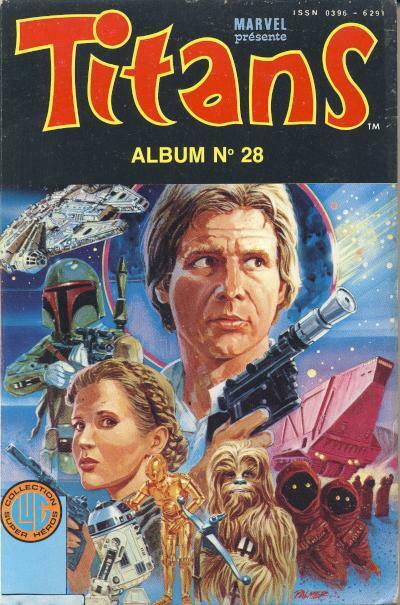 Titans Album #28 has the same cover as Marvel Comics Star Wars #81. 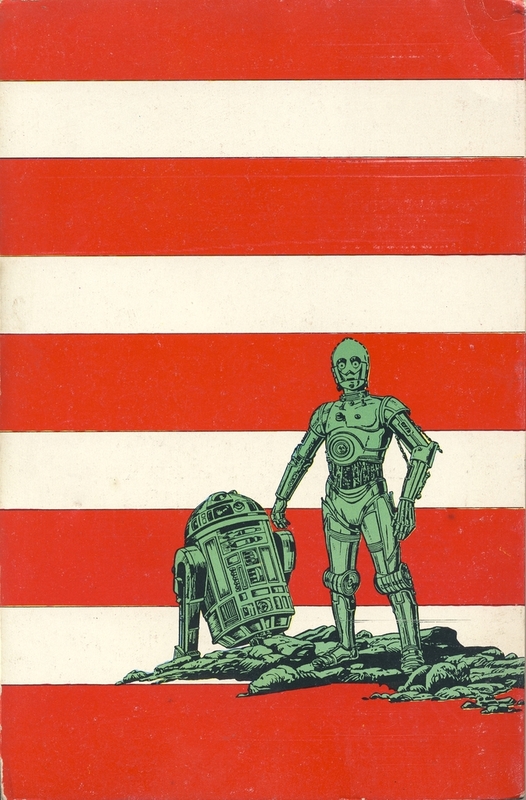 The back cover contains a familiar drawing of the two droids. This back cover art was used as art in the French la Guerre des Etoiles (Star Wars) trade paperback and again on the back cover of Top B.D. Album Relie #3. 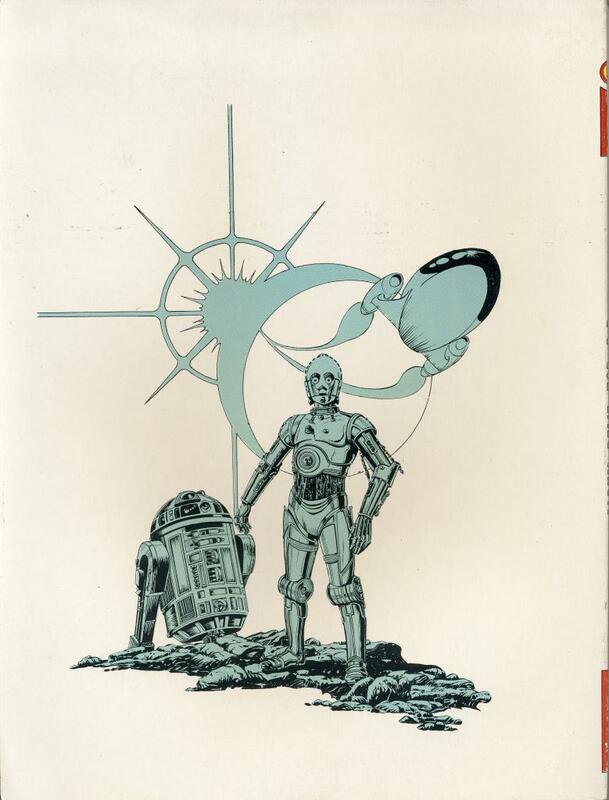 I don't remember seeing this drawing of the droids in any U.S. edition of Star Wars comics. Few characters introduced in the original Marvel Comics run were used outside of the comic and Shira Brie is one of those characters. She started off as a companion pilot for Luke Skywalker in Star Wars #56 which quickly developed into a romantic relationship over the next few issues. 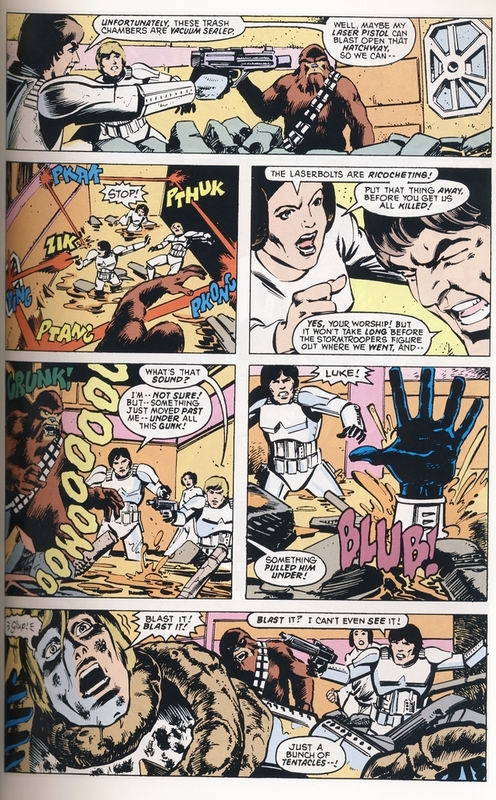 In issue #61, on a mission which involved Rebel pilots flying TIE Fighters, Luke shoots down Shira's TIE because the force revealed to Luke that hers was an enemy piloted craft. 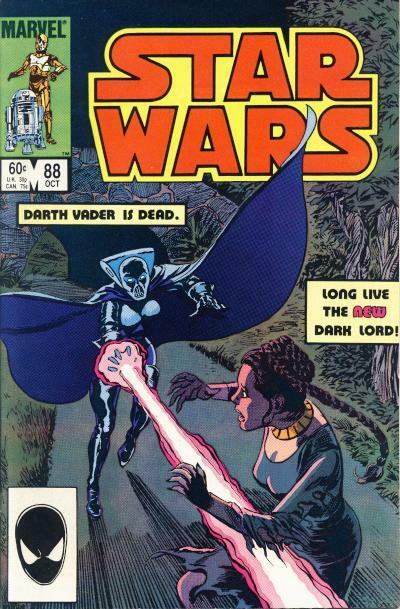 In Star Wars #63 we learn that Shira Brie was a spy for the Empire and Darth Vader had rescued her for rehabilitation and training as a dark side user. She would return in Star Wars #88 as the cyborg Lumiya and is defeated by Princess Leia in battle. In the battle against Leia, Lumiya's cybernetic armor is damaged and she dons a new outfit the next time she is shown in Star Wars #95. This time, Lumiya has ditched the Vaderesque cloak and body armor. She is wearing a different headdress, a lighter body suit, and wields a lightwhip. 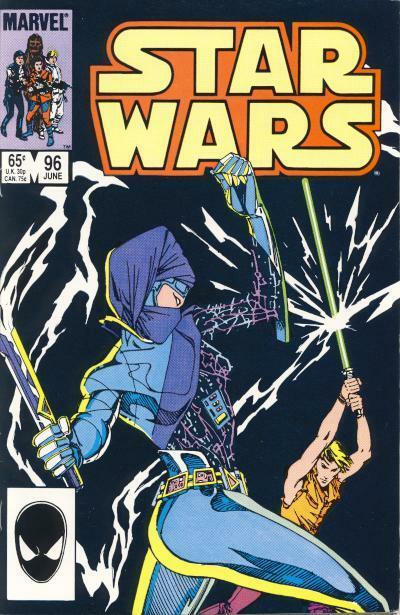 The cover to Star Wars #95 shows the old armor even though she is wearing her new outfit inside. The cover to Star Wars #96 shows the new outfit. 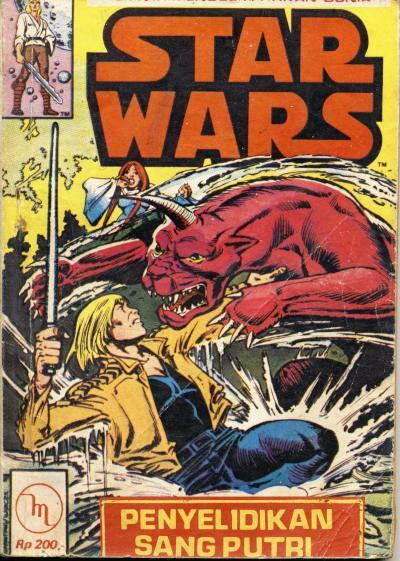 She goes on to battle our heroes until the final issue Star Wars #107. In 2006, Del Rey would reintroduce Lumiya in the 9 book series Legacy of the Force. In that story, she is the mentor to the fallen Jedi, Jacen Solo. Shira Brie's appearances do not command a premium over surrounding issues although her inclusion in the Legacy of the Force storyline did spark an interest in her back story. The reason her first appearance may not be valued more than surrounding issues is Star Wars #55 through Star Wars #63 are some of the most common Star Wars issues found in high grade. The Comics Chronicles posted their March sales estimates, and Princess Leia #1 followed Star Wars #1 and Darth Vader #1 with strong sales. It came in 1st place on the chart with over 253,000 copies ahead of Star Wars #3 in the second position with over 161,000 copies! Princess Leia #2 took the 4th place with over 96,000 copies and Darth Vader #3 placed a respectable 8th place on the chart with over 85,000 copies. Star Wars titles accounted for 4 of the top 10 titles in March. Star Wars #2 reorders took the 80th place with over 27,000 copies and Darth Vader #2 took the 223rd slot with close to 8,000 reordered copies. 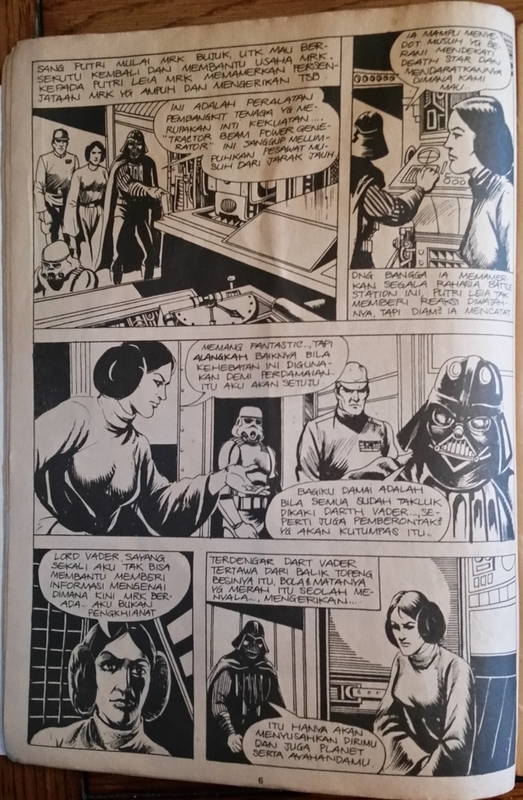 Please read the blog posting March 2015 comics sales estimates online; Princess Leia #1 tops 250k. 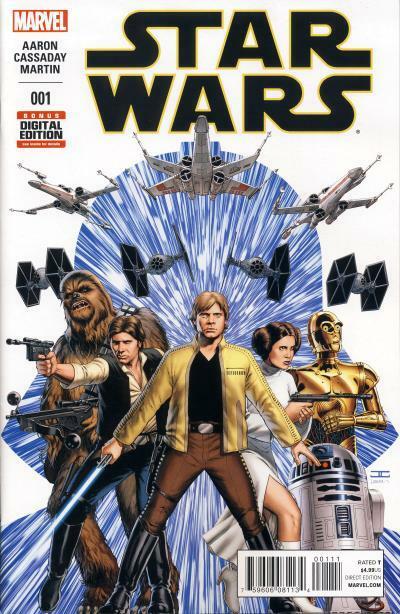 In January 2015, Marvel Comics returned to publishing Star Wars comics in a big way. Star Wars #1 was a tremendous success, with a myriad of variant covers and multiple printings; there have been over 1 million copies printed. What about the story inside? Is the comic worth picking up? Hopefully this review will help answer those questions. 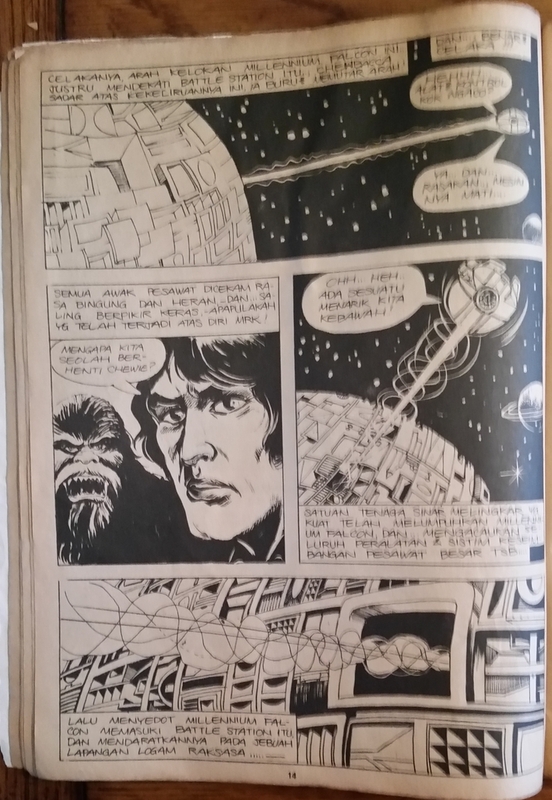 The story opens with a page with the familiar "A long time ago in a galaxy far, far away..." followed by a 2 page spread of the words Star Wars. 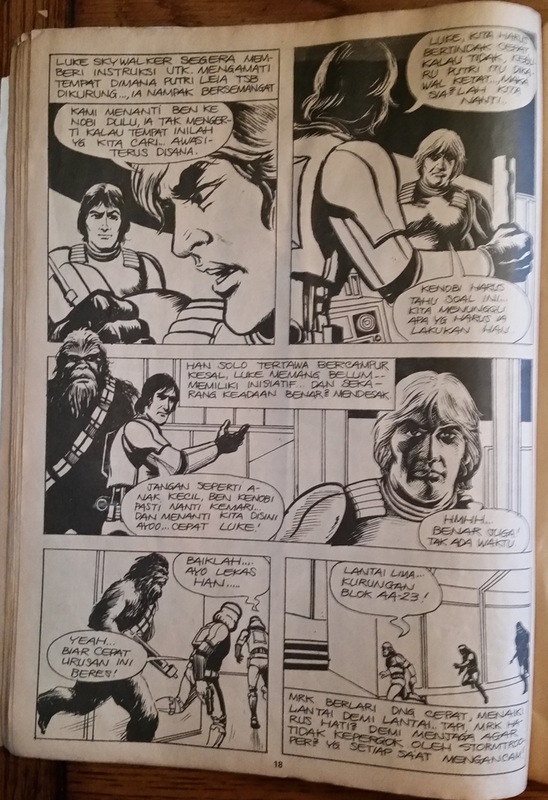 The subsequent page has the familiar Star Wars crawl titled Book I Skywalker Strikes and goes on to explain how the Rebels want to press their advantage against the Empire after the destruction of the Death Star. We then see a ship approach an Imperial facility on Cymoon 1. Han Solo, Princess Leia Organa, Luke Skywalker, and R2-D2 depart the shuttle and Han Solo introduces himself as a representative of Jabba the Hutt. Leia and Luke are in disguise and Chewbacca is hiding nearby. We also learn that C-3PO is watching the Millenium Falcon, also located nearby. Han talks to Imperial Overseer Aggadeen and we learn the Imperial facility is the Empire's largest weapons factory and the Rebels hijacked Jabba's real negotiator. Han is pretending to be the negotiator sent by Jabba and the Imperial explains there will be no negotiations, but they will impose their terms on Jabba. Once inside the base, the Rebels spring into action to destroy the weapons facility. Han, Leia, and R2-D2 work on destroying the base while Luke standing guard discovers Imperial prisoners which he frees. Meanwhile, outside, Chewbacca reports the arrive of an Imperial Shuttle with Darth Vader aboard. Leia orders Chewbacca to kill Vader, but Vader repels the attack, although his cadres of Stormtroopers are not so lucky. We learn C-3PO's job is to engage the Falcon's autopilot to help the Rebels escape, but the Falcon, hidden in a refuse field, is being dismantled by scavengers. Han devises another plan to use an AT-AT to escape in instead. 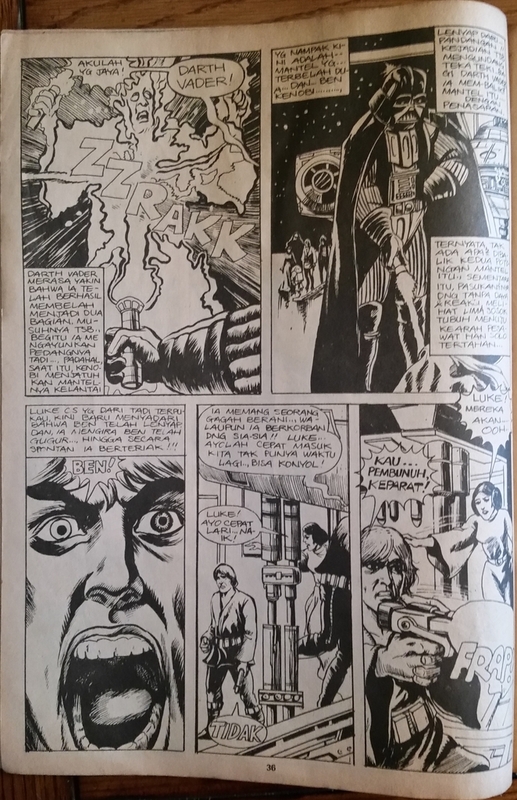 Luke Skywalker sense Darth Vader's presence at the base and comes face to face with him on the last page. Marvel did themselves a huge favor by using the main characters in their first story. Dark Horse spent years trying to tell different stories with other characters and only had minor success. To appeal to a larger audience only familiar with Star Wars from the movies, this comic is a terrific introduction. The introduction pages are obviously inspired by the movies and are welcome. Having every issue of the comic start off this way would be superfluous, but having every arc start this way would be terrific. The plan setup by the Rebels feels right and the characters are used effectively in the plan. I like that the story draws on many elements of Star Wars and does not just rely on those elements introduced in first movie. Having our heroes start off with a confrontation with the Empire does not feel forced and Han Solo, Princess Leia, R2-D2, and Chewbacca are used well in this story. Darth Vader showing up in the first issue is a nice surprise and the cliffhanger ending is used effectively here. My favorite moment is when Leia orders Chewbacca to kill Vader. After what she went through on the Death Star, this feels like a natural reaction she would have. Additionally, having Chewbacca kill all the Imperials except for Darth Vader was a cool scene! There are some changes to the Star Wars story that do not resonate well with me. Having it be generally known that the Death Star existed, let alone that is was destroyed is one. Additionally, having Han Solo embrace his role as a Rebel this early feels off. After the destruction of the Death Star, Han Solo and Chewbacca need to leave and should be brought back into the Rebellion organically. 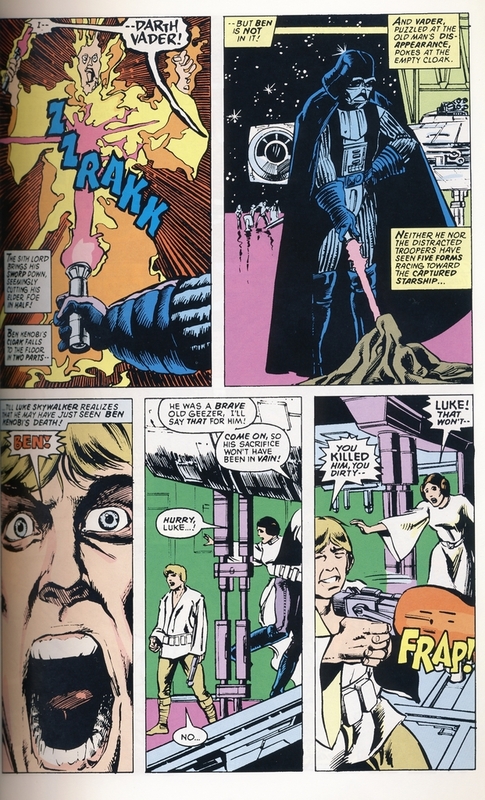 Finally, having Luke Skywalker confront Darth Vader so early also feels forced. It makes sense that Marvel wants to distance themselves from past Star Wars stories, but this story does not feel like it fits between Star Wars and The Empire Strikes Back seamlessly. To get to situation as seen in The Empire Strikes Back, there is going to need to be some developments, including a Rebellion that is on its heels and not able to carry out bold attacks against the Empire. Notice that I mentioned all the characters are used well except for Luke Skywalker. For a story titled Skywalker Strikes, Luke has surprisingly little reason to be part of the planned attack on the weapons factory. 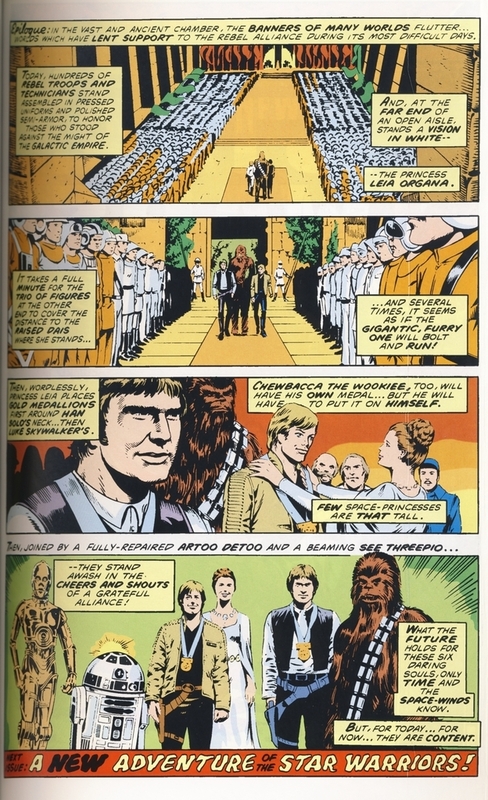 Luke discovers the prisoners, who presumably will have a larger role in subsequent issues, and he is instrumental in the cliffhanger ending, but both situations occur because Luke "wanders off" and not because he is engaged in the Rebel operation. I suspect Luke's role will increase with subsequent issues in this arc, but so far it feels more like a Han Solo Strikes story. This is more a complaint against modern comic story telling techniques, but not much happens in this story. 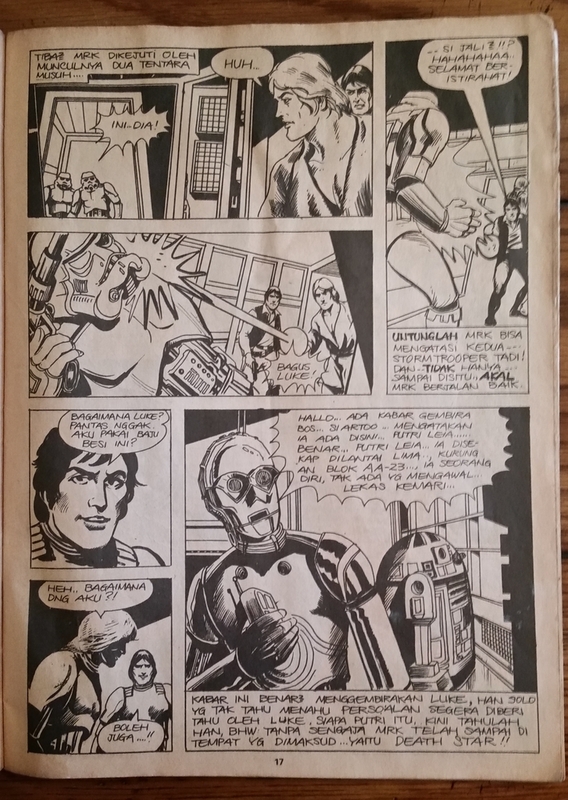 This is a biased based on my love of the original Marvel Star Wars comics, but the events in this comic would have occurred in 4-6 pages in an original Marvel issue. 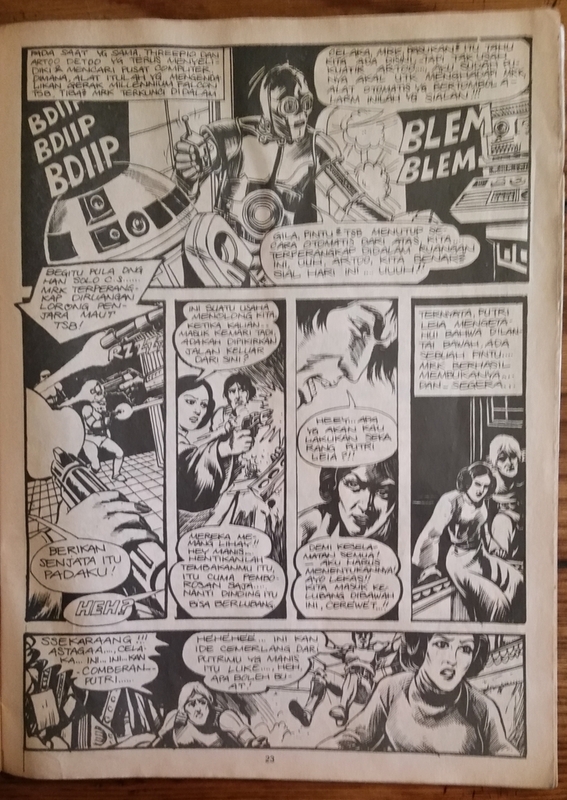 Additionally, the lack of thought balloons and text boxes is overcome by having C-3PO speak dialogue to explain the situation. Unfortunately, much of this dialogue does not sound like C-3PO. Overall, I feel Marvel is off to a strong start with the new Star Wars title and it is understandable they want to break with the past stories from the Expanded Universe. I am not keen on modern comic story telling because it limits the tools that a writer can use to convey the story. Regardless, most of the characters are used effectively and I have high hopes that Luke Skywalker will have a purpose for being in this story. The cliffhanger ending alone will draw me back just to see how Marvel will resolve this situation without trampling on a main part of The Empire Strikes Back. Star Wars #4 has a Boba Fett action figure variant cover that is an exclusive from John Tyler Christopher. The comic has already sold out on his website for $20 each, but there have been some held back for C2E2. Additionally, some have been held back for sale at a later date. This comic is limited to 5000 copies which is the same as a 1:25 variant for a comic that sells 125,000 copies. 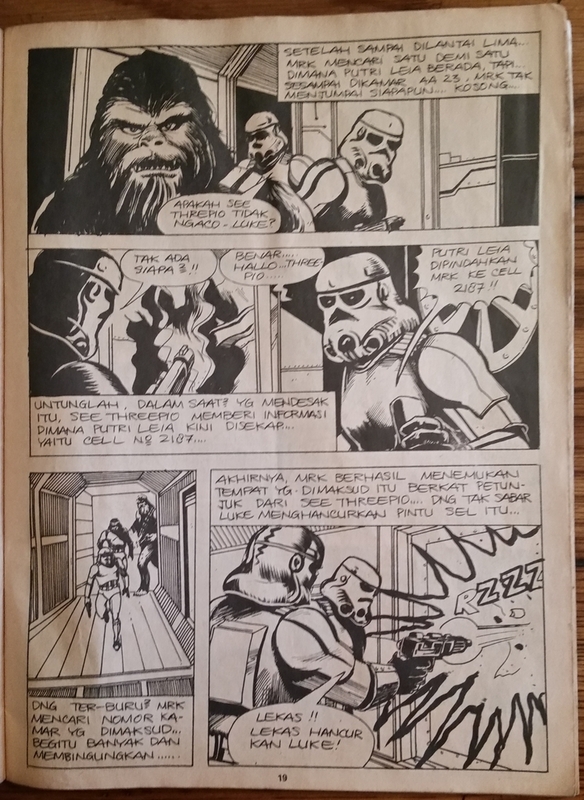 Boba Fett's appearance in Star Wars #42 sells for roughly $80 in NM condition raw. In CGC 9.6 it sells for about $150. There were several Star Wars #1 variants in January that had print runs of 3000 and 1500 copies with Boba Fett covers that do not sell for much more than they were originally offered. Arguably, this is not the best Boba Fett cover available. When you consider Marvel's original run, Dark Horse's various titles, and the new Marvel titles, there are many choices for Boba Fett covers available to fans. These action figure variant covers are neat, but they don't depict the original packaging these figures appeared in which I feel limits their appeal. There does seem to be a collector base for action figure covers. Whether or not this is a passing fad or a permanent fixture in the comic collecting world remains to be seen. I personally believe this variant has limited upside long term and will probably sell for $30 or less a year from now. Speculators hoping to cash in on Boba Fett appearances in comics would do better to pick up one of Boba Fett's first appearances in Marvel's original title. You can read more about this Star Wars #4 Boba Fett action figure variant cover over at Bleeding Cool. Princess Leia #1 is the top selling comic for March 2015 and 4 of the Top 10 spots are Marvel Star Wars titles. Head on over to The Comics Chronicles to read more. These next two comics from Indonesia were published by Yayasan Karya Bhakti Bandung. 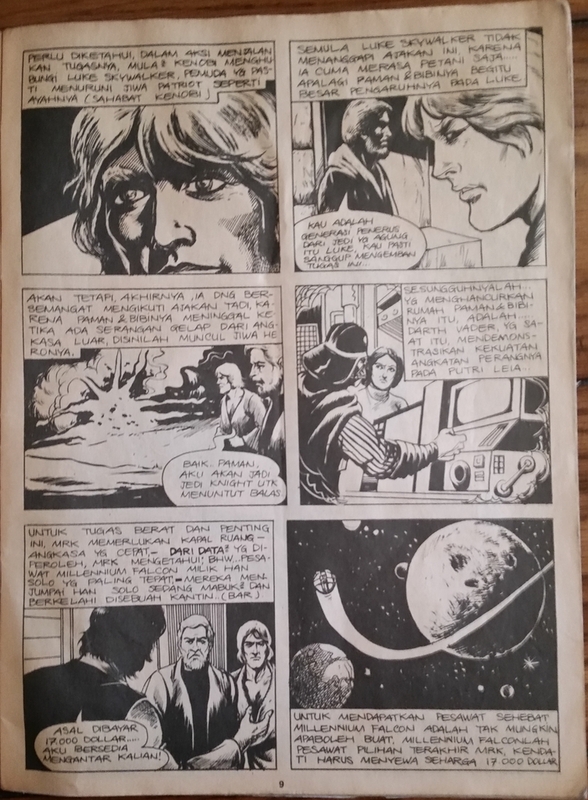 These are digest-sized, black and white comics with the lead story being Star Wars and another non-Star Wars back up story. 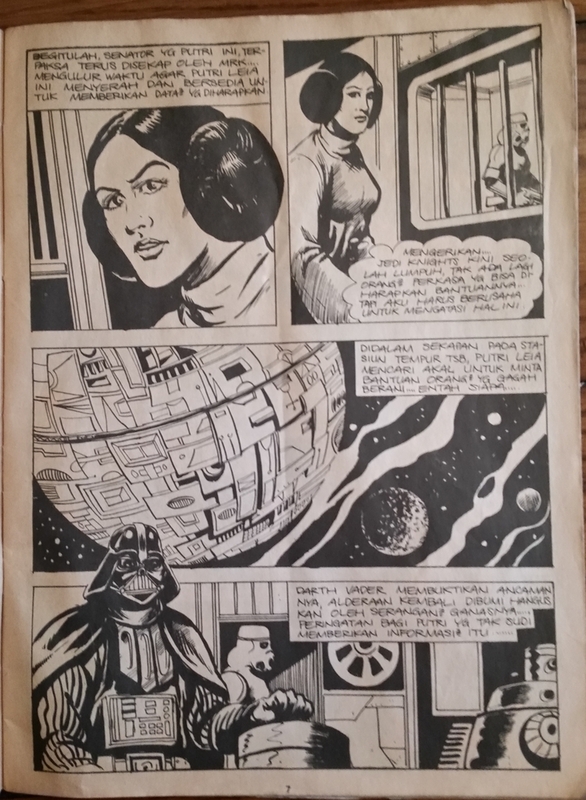 The first comic is the first half of Marvel Comics Star Wars #30 titled A Princess Alone. This issue is titled Penyelidikan Sang Putri which translates to Investigation of the Princess. 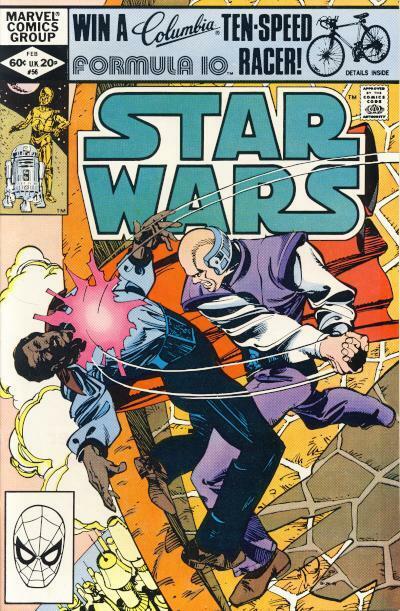 The cover is from Marvel Star Wars #36. 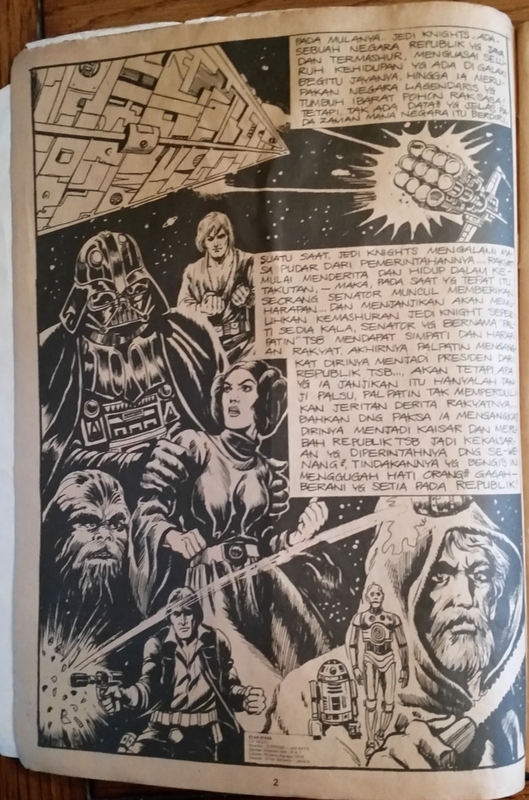 The second comic is the second half of Star Wars #30 and is titled Lolos Dari Metalorn or Escape From Metalorn. 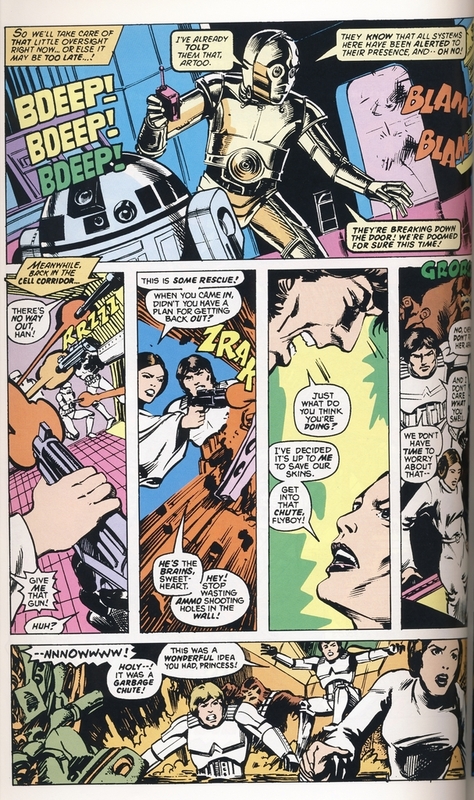 The cover is from Marvel Star Wars #34 and has Luke Skywalker mentioning Princess Leia's confrontation with Baron Tagge from the story inside. 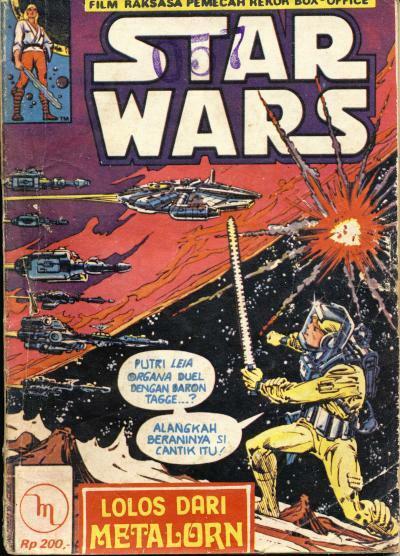 These are Indonesian editions of Marvel Star Wars comics. The art on the covers and inside are not redrawn from the Marvel issues. I would guess these are licensed comics. 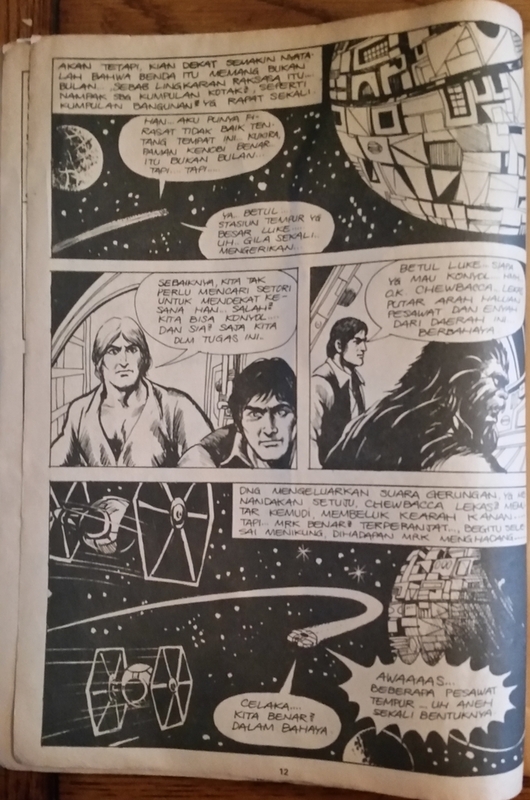 Starting in July 1978, famous Indonesian cartoonist and illustrator Jan Mintaraga started an adaptation of Star Wars which lasted for 3 issues. 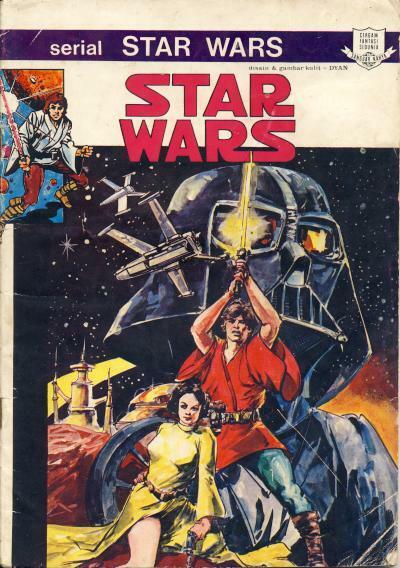 Issue #1 is titled Star Wars and was released before the Star Wars movie opened in Indonesia. All 3 issues are in full color and are pamphlet sized comics. They were published by Sanggar Karya. 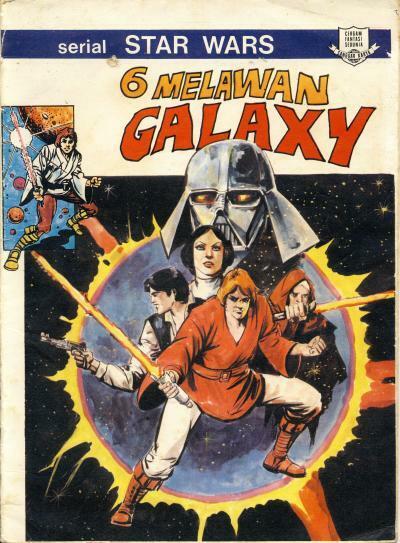 Issue #2 is titled 6 Melawan Galaxy or 6 Against the Galaxy and features a cover similar to Marvel Comics Star Wars #1. 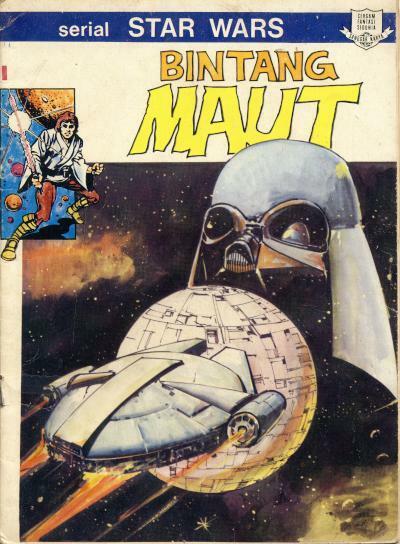 Issue #3 is titled Bintang Maut or Death Star. If these titles sound familiar, that is because they are the titles of the chapters in the Marvel Comics adaptation. These three comics were clearly inspired by the Marvel comics and include many similar panels. The same cut scenes from the movie used in the Marvel adaptation are also here like Luke Skywalker's meeting with Biggs Darklighter on Tatooine and the infamous scene with Darth Vader holding a cup during the Death Star briefing. Each issue ends at the same point the Marvel issues end. Issue #1 ends with Luke Skywalker being attacked by the Tusken Raider. 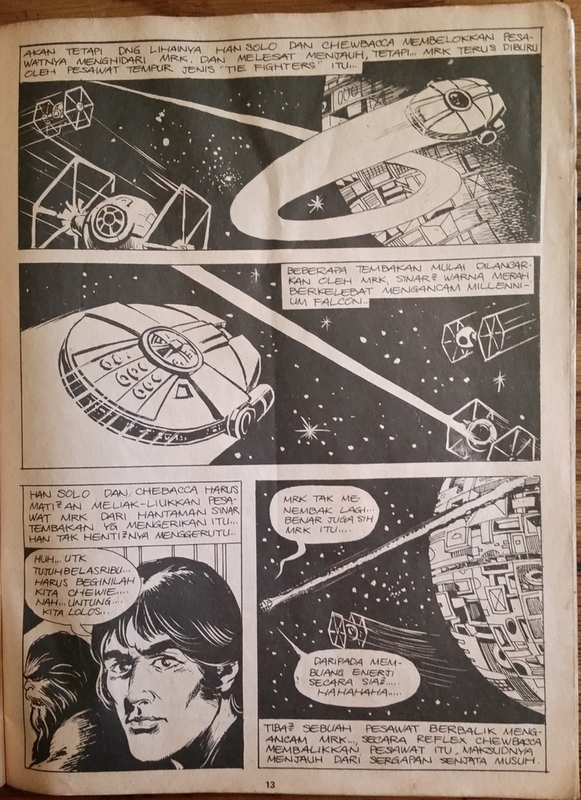 Issue #2 ends with the Millennium Falcon making the jump to hyperspace after the escape from Tatooine. And finally, issue #3 ends with the prison escape on the Death Star. I would like to know why the 2 different Indonesian movie adaptation of Star Wars did not use the Marvel art but instead redrew that art. Jan Mintaraga's art is different than what U.S. audiences are use to. Not the that art is bad; at points it is detailed and very dynamic. 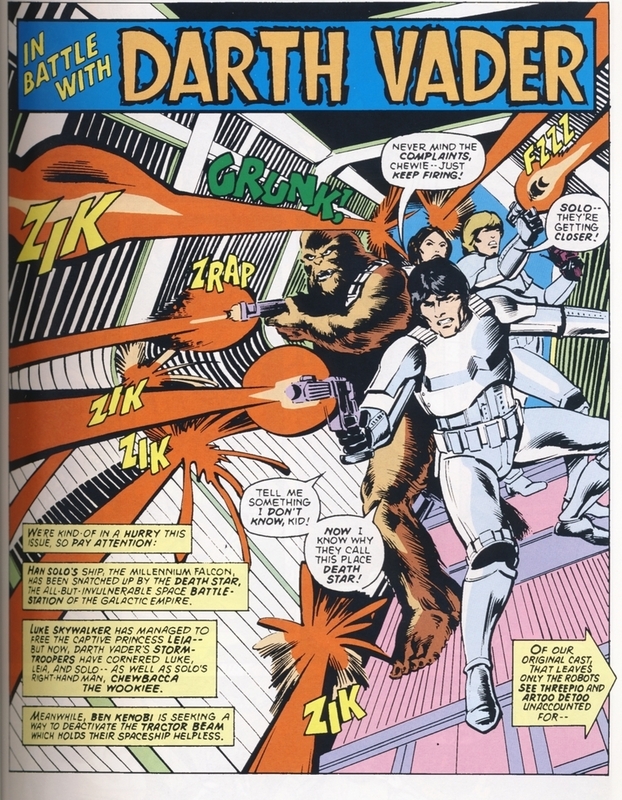 Unfortunately, if Jan just had the Marvel adaptation to use for reference, that is unfortunately, especially since Marvel Star Wars #1 was rushed to print and the art suffers because of it. The art on the covers is reminiscent of the art inside these issues. I have not found any evidence this series continued past issue #3. 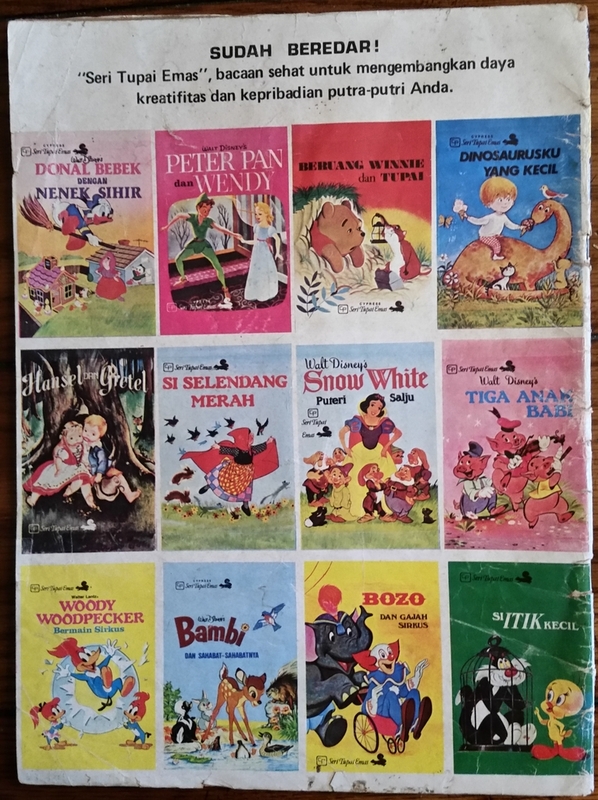 Like the treasury sized comic published by Cypress Penerbit, it is doubtful these Sanggar Karya published issues are officially licensed comics. 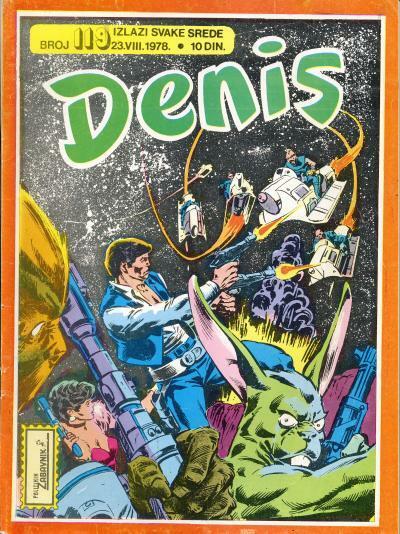 Relative to the other Indonesian Star Wars comics, this appear to be the most common of the Star Wars titles. Star Wars comics published in Indonesia are as disjointed as this archipelagic state of 17,508 islands. It boasts the 4th largest population in the world and there have been several publishers of Star Wars comics. 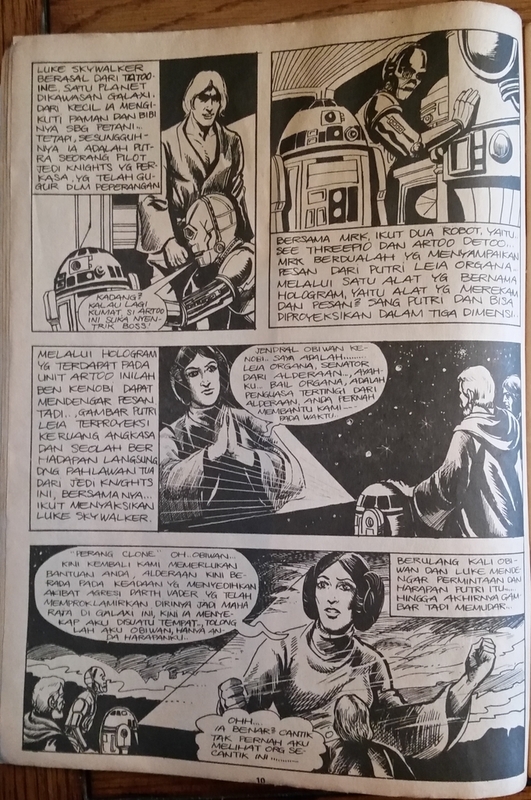 The full picture of all the Star Wars comics published in Indonesia is not completely understood yet, so I am starting a series of blogs that will attempt to examine what is known and hopefully over time a complete picture will emerge. 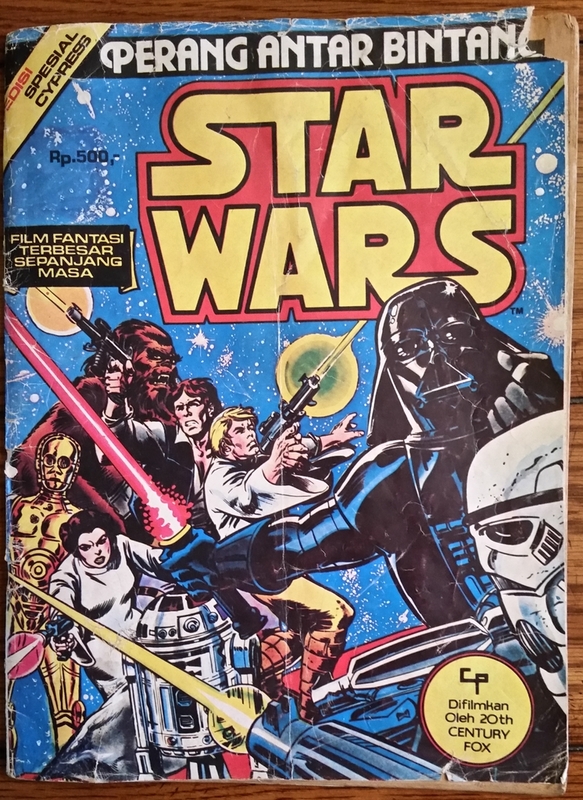 This Indonesian Star Wars comic was published by Cypress in the capital of Jarkata on the fifth largest Indonesian island called Java. 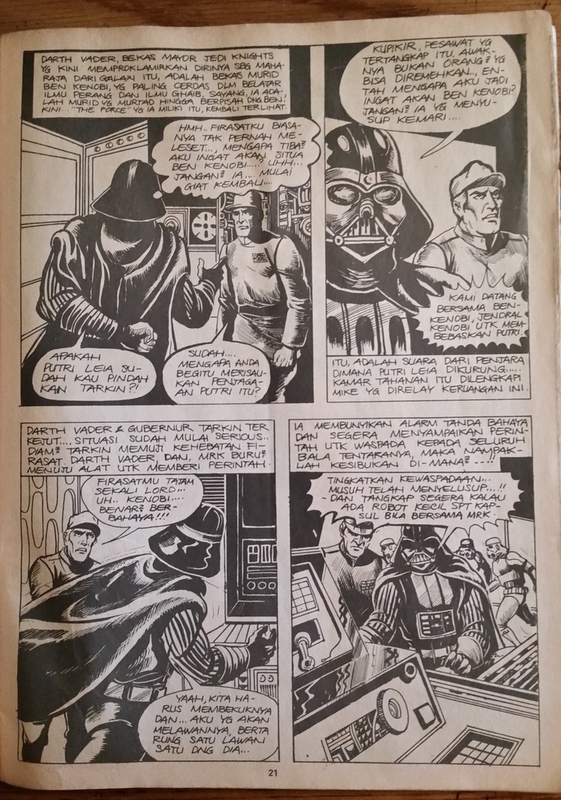 It is a treasury-sized black and white comic which has the same cover used on Marvel Special Edition Star Wars #2. Despite the cover, the interior contains a full 72 page adaptation of the Star Wars movie... mostly. 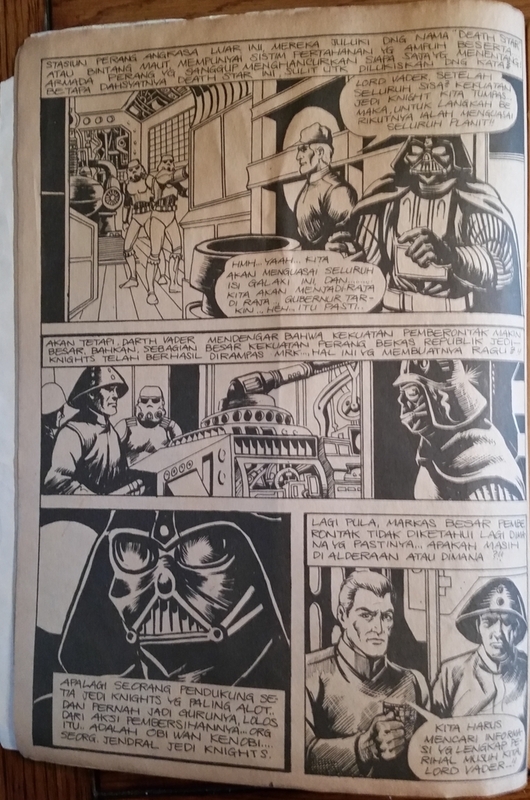 Without actually translating these pages, it is clear that Darth Vader's role has been enhanced. Additionally, the first half of the movie has been abbreviated with Princess Leia being captured by Vader and brought aboard the Death Star. Luke Skywalker, Han Solo, Obi-Wan Kenobi, Chewbacca, C-3PO, and R2-D2 are also introduced into the story already aboard the Millennium Falcon. In what I believe to be a flashback, Luke and Ben recount the story of Leia's familiar plea for help. The Millennium Falcon encounters the Death Star and is captured. Ben goes off to disable the tractor beam while Han, Luke, Chewbacca, and the droids encounter Stormtroopers and Han and Luke don Stormtrooper armor. They find the prison cell holding Leia and we are current with the story at the end of Star Wars #3. Overall, the comic does a good job of summarizing the first half of the story and ending where Marvel Star Wars #4 picks up. Some of the panels are very similar to the original panels, whereas other panels are clearly different. The characters have a little bit of a manga feel to them in the redrawn pages. 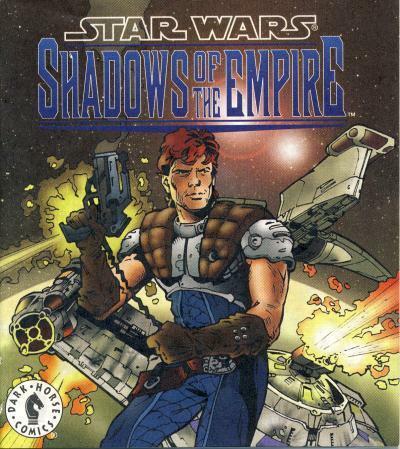 I have a hard time believing this was an officially licensed adaptation of Star Wars and it probably is not. We've seen foreign publishers take liberties with covers and the packaging of the Marvel adaptation, but this comic takes these liberties to an entirely different level. What is fascinating is this is not the only Indonesian adaptation of Star Wars. 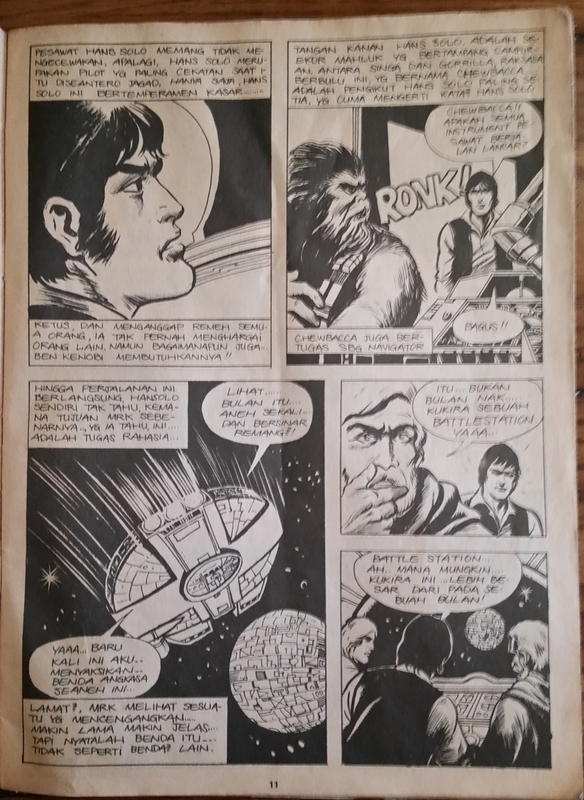 Additionally, there are other original material Star Wars comics from this country.